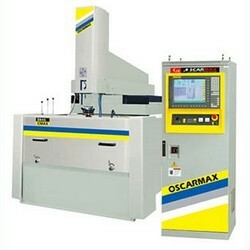 CMAX S645 is Advanced CNC type of sinker edm machines. It features with 3D Mode motion machining. The oil tank capacity is up to 964liter. The 6 axes are controllable with C, A, B axes which are optional electrode head. Moreover, it can be connected with robot hand, allow to change the electrodes by the robot hand. The machine body is made by casting, where can be load up to 3000kg. The work table is 1000 x 600mm, mostly being used in production of automobile industry.